Boneless skinless chicken breasts are packed with protein while being lower in fat and calories than dark meat chicken or chicken cooked with the skin on. Smoked chicken breasts make an excellent lean protein source for any meal. You can refrigerate cooked smoked chicken breasts and slice them to use in place of fattier sandwich meat as a healthier lunchtime alternative. Home-smoked chicken is also lower in sodium than prepared smoked chicken you buy at the store. Place boneless, skinless chicken breasts in a bowl and either pour your favorite marinade over the meat to coat the chicken or rub your favorite dry spice rub all over the meat. Look for a spice rub that is made without MSG or excess salt or sugar. Cover the bowl with plastic wrap and set it in the refrigerator to infuse the chicken with flavor for one hour. Soak your favorite type of wood chips in a bowl full of cool water for one hour. Drain the wood chips. Place the chips in your grill's smoker tray, if it has one. 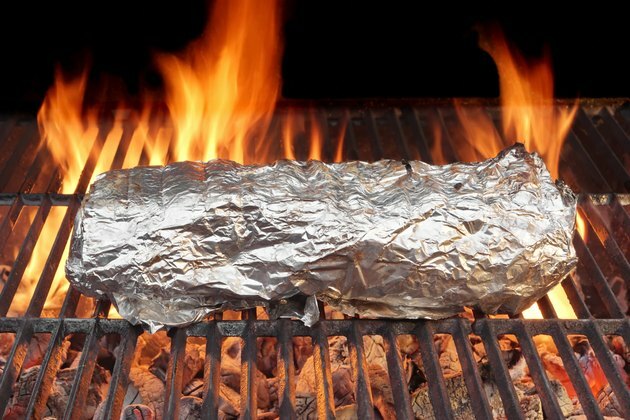 Or put the chips on a large sheet of aluminum foil and fold up the sides of the foil to form a package around the chips. Use a fork to poke holes at the top of the package so smoke can escape. Light a charcoal grill and, when the flames have died down and the coals are glowing, place the smoker tray or foil package directly on the charcoal briquettes. Close grill lid and let the wood chips get hot for five minutes. Remove the chicken from the bowl and drain any remaining marinade. Place the chicken breasts on the grill grates and close the grill lid. Grill the chicken for eight minutes, then flip with tongs and grill on the second sides for another eight minutes, again covering the grill. Use a meat thermometer to check that the chicken is fully cooked. Remove the chicken from the grill when the internal temperature reaches 165 degrees Fahrenheit. Place the chicken on a serving platter and serve hot, either plain or alongside your favorite healthy, low-sugar barbecue sauce. Make your own spice rub and barbecue sauce if you can to avoid consuming large amounts of salt, sugar or preservatives. Smoking on a gas grill doesn't work very well. If you have a gas grill and you want to smoke chicken with it, consult with your grill's manual to see if it is recommended.